Has your garden had its tea this morning? Tea is all the rage for plants and soils these days. Compost tea. And not just any old compost tea, but tea you steep in water that’s aerated just like an aquarium. 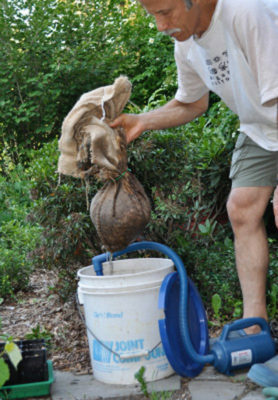 Compost tea steeped the old way, by hanging a burlap sack of compost in a bucket of water for a few days, was one way to provide a liquid feed to plants. The liquid feed wasn’t particularly rich but did provide a wide range of nutrients that leached from the compost, and was convenient for feeding potted plants.